TheBabyMarketplace.com is having a fall free shipping sale! Until October 1, you can get free shipping when you with code "FreeShip". That's a savings of $9 off the regular flat rate shipping cost! Large selection of quality products, including clothes, shoes, toys, diapers and accessories, bathing products, feeding products, organic skin care products for Mom and baby, and other Mom stuff. Bulk diaper pricing and diaper sampler packages. Brand names such as Hula Mula, Deux par Deux, Knuckleheads, Zutano, and for shoes you'll find Little Soles, Jack and Lily and Bical Grippers. Baby Gift Registry - If you are expecting, create a Baby Gift Registry and earn Registry Rewards. They'll send you a gift card valued at $10 for every $100 purchased from your registry! Eco-conscious shoppers alert: get 15% off KaiKids.com with this code. KaiKids.com offers eco-friendly, ethically manufactured clothes, bedding and products aimed at babies, toddlers and pregnant and nursing mothers. Bamboo sheets, natural soaps, non-toxic baby bottles and toys are just some of the items you'll find at this e-tailer. If you're an eco-conscious mom that cares about you and your family's eco-footprint, then this deal is for you! Get special discount with code "babyvibe2" for 15% off until Oct. 7, 2009. Babyvibe publishes informative twice-weekly newsletters for BC and Calgary. 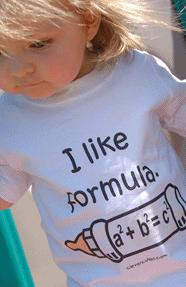 Get 15% off cutie-pie sibling or geek-themed designs from CleverCuties.com with these discount codes! CleverCuties.com specialises in kids T-shirts and onesies with "Geek" themes. There are also toddler sized T's and sizes for adults. 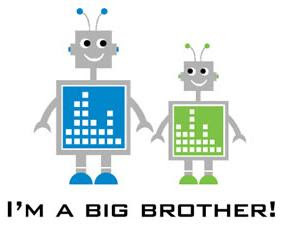 One of their unique lines are designs for siblings - Brother and Sister themes. Many of the sibling designs can be personalized with your child's name, too! Pretty cool, these would make great gifts! You can get 15% off the Brother Sister Sibling T's and Onesies from now until Sept. 30 with code "rogers"! You can also get $5 off any $30 purchase from now until Sept. 30 with code "mysterio"! CleverCutie.com is based in the US. Shipping to Canada is a flat rate of $4.95 for unlimited items! If you live in the US, shipping is FREE. Yes, I just blogged about TJ's the Kiddies Store's huge Britax sale, but they also have some other sales going on too! There are also strollers (including Peg Perego, Guzzie+Gus) and booster seats that the store has had on sale for a while now. If you live in the Lower Mainland, you can order online and pick up in-store. They do deliver, but there is no shipping list price so it looks like the cost will depend on what you are purchasing. There's a huge Britax sale coming up in Vancouver at TJ's the Kiddies Store! This comes on the heels of the upcoming Britax sale in Ontario coming up on Sept. 26 that I blogged about last week. TJ's the Kiddies Store will be holding a Britax Tent Sale for one day only, on October 3rd. ALL Britax carseats will be discounted, including CS models! Some sale prices are discounted up up to $70. Even the newest seats will be on sale for big discounts! Britax carseats rarely go on sale, let alone at these types of discounts, so if you were planning on purchasing a Britax this sale is definitely the time! Click here to view the sale information from the TJ's the Kiddies Store website, store locations and hours. Check out the latest fall baby and toddlers styles at GingerbreadMonkeys.com and get an extra 20% off everything with this special fall promotion code! GingerbreadMonkeys.com is a Canadian online maternity & children's boutique, offers a collection that is fresh, dynamic and practical. This e-tailer offers lots of products to choose from, and there's always a great selection of sale items, too. Get an extra 20% off with code "fall20" when you check out! Expires Sept 24, 6pm EST. Here is another super deal! You actually will make $5 with this deal. 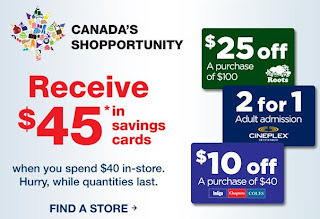 The promotion is called Canada's Shopportunity. When you spend $40 at Roots, Indigo Chapters or Cineplex Theatres, you'll get $45 back in savings cards - which means you'll be up $5. $25 off a $100 purchase from Roots Canada. 2 for 1 adult admission from Cineplex Theatres. $10 off a purchase of $40 from Indigo Chapters or Coles. Click here to view the advertisement from Roots Canada. * See in store for details. While quantities last. Offer valid In-store only. Not redeemable for cash, nor is it valid for any previously purchased merchandise. Raspberry Kids and Spud.ca are running a cross-promotion. Get special discounts with either one of these companies with these special codes. Save 15% on any purchase from Raspberry Kids when you use promo code "spud15". Use promo code RASPBERRYKIDS at Spud.ca to save $25 off your first 4 orders ($5 off your 1st, 2nd and 3rd orders, and then $10 off your 4th order). You must place your first 4 orders before December 6, 2009 to qualify for the rebates. If you never plan to order with Spud.ca again, you'll at least save $5 off the first order. Read more about Spud.ca in my previous blog posting from last week, click here to view the post. Get up to 40% off summer styles at Bumblewee Nursing Wear! No code needed for this sale: click here to view the summer clearance sale specials! BumbleWee Nursing (http://www.bumbleweenursing.ca) offers stylish 2-in-1 tops, dresses and pajamas that go from maternity to nursing. Many of their tops, dresses and pajamas are "2-in-1", which means that they are sized to be used during pregnancy as well as through nursing, so you won’t need to buy a separate wardrobe for each! Sears Canada is having its "Sears Days" sale - you'll find items up to 40% off. Save even more with a code for $20 off a $200 online purchase! If you have any major purchases to make that you can purchase from Sears, during this sale would a great time to do it! With Sears, it's easy to order online and pickup in-store, or have it delivered right to your house! Get the $20 off a $200 purchase when you use bonus code 941 612 455 at checkout! This code is good until September 30, 2009. See below for restrictions. The fine print: Must enter bonus code at checkout. Total merchandise order before taxes and applicable charges. Offer valid September 16 until September 30, 2009. Limit one Bonus Offer Number per order; cannot be combined with any other Bonus Offer Number. Excludes items with prices ending in .97, items on sears.ca/outlet, cosmetics, fragrances, electronics, Gift Card purchases, deferral or installment billing fees, protection agreements, delivery, installation and maintenance charges. Not negotiable, transferable or redeemable for cash. Not acceptable for Sears Card Account payments. Only valid on Sears.ca. Not valid in-store. From now until November 5, 2009, you'll get triple the points when you enter a Pampers Gifts to Grow points code from a Pampers Wipes product! 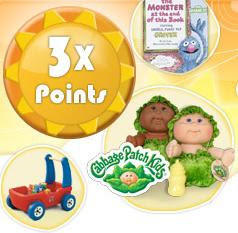 Check the Pampers Gifts to Grow website for the qualifying wipes products for this special triple points promotion. Never heard of Pampers Gifts to Grow? It's the rewards program from Pampers. Inside each package of Pampers product, such as diapers or wipes, there is a special code that you can enter on the Pampers website. The code will give you points that are accumulated towards rewards! It looks like Pampers has finally updated the program with some better rewards, but you do need a lot of points. For example, 70 points you can get a Fisher Price Clutch and Shake Turtle. 75 points will get you a Dora Soft Potty Seat, 100 points gets you a Set of 3 Sesame Street Books, and 420 points will get you a Fisher Price Rock n Ride Trike. If you've just joined the program, or recently joined, here is my list of free Pampers codes to help you save towards that freebie! One of the specials at Spud.ca this week is gDiapers! All gDiaper Starter Kits and Refills are on sale. You can get an even bigger discount with a special code. Refills are on sale for $17.69 (reg. $19.65), and the starter kits, which include 2 cloth pants and 10 refills, are on sale fro $26.98 (reg. $29.98). Use code RASPBERRYKIDS (courtesy of RaspberryKids.com). This will entitle you to $25 off your first 4 orders with Spud.ca ($5 off your 1st, 2nd and 3rd orders, and then $10 off your 4th order). You must place your first 4 orders before December 6, 2009 to qualify for the rebates. If you never plan to order with Spud.ca again, you'll at least save $5 off the first order. Make the minimum required purchase to get free shipping. The required purchase amount varies depending on your location. For me, it was $35. Even if you don't purchase enough for free shipping, the cost may still be very low - my estimate was $3.50. If you use medium or large gDiapers, consider adding the refills to your "standing order" with Spud.ca to save an extra 5%. By adding a standing order item, you will receive it on a recurring basis, at least once every four weeks (you get to choose the frequency). Spud.ca deliveries local, organic, minimally packaged and eco-friendly groceries and products right to your door. I am a big fan of the idea of grocery shopping online, as this would be such a huge timesaver and would save me from carrying all those groceries! I only just made my first purchase with Spud.ca this week though, as I did find the products to be on the higher-priced end. However, the products they carry are quality organic or eco-friendly products, and Spud.ca is trying to stay competitively priced on products. Their price comparison chart shows how they are trying to be competitively priced. I think this is a great service for all busy mommies, it saves time and travel costs, too. Old Navy Canada stores is having a "2 for Tots" baby sale. They have "1000 items for sale starting at 2 for $10". All their baby costumes for Halloween are also under $20. Sounds like it's worth checking out! This sale is on now until Sept. 24, 2009. Click here to view the Old Navy 2 for Tots Baby Sale online advertisement. I sure wish I could be in Toronto for this sale! 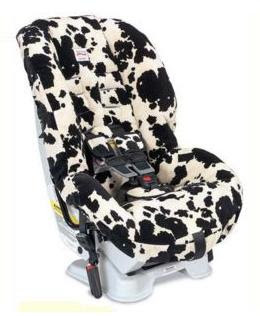 Dear-Born Baby is having a one-day Super Sale on all their Britax car seats. This huge event will be coupled with a Car Seat Clinic provided by St. John Ambulance. St. John Ambulance will install your car seat for you for just $20 (taxes included!). 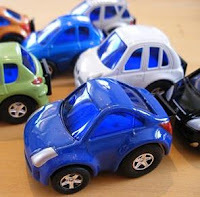 The Britax Super Sale includes a good number of models, including the Chaperone, Roundabout, Diplomat, Marathon, Boulevard, Advocate, and some CS models. To view the complete sale details, including sale price examples, go to http://www.britaxcarseatsale.com. Shifeon skin care and beauty boutique has a fabulous exclusive deal for Canada-Mom-Deals readers! Not only do they carry a large selection of skin care, fragrance, nail polish, and make up, but they also carry the German-made Sebamed Baby product line. Sebamed is a pH 5.5 soap-free skin care line that has been scientifically developed to the same pH range of human healthy skin, which has a slightly acidic pH value of 5.5. How is this better for your skin? It's supposed to be less disturbing to your skin and therefore the product won't damage or dry it out. The Sebamed Baby product line includes cream, lotion, diaper rash cream, wipes, face cream, bubble bath. And Shifeon has offered a great deal for Canada Mom Deal readers to give these products a try! Get $5.00 off any Sebamed Baby product purchase! Just use coupon code CMD00001 at the end of the check out in the comment box! Shifeon has a second exclusive coupon code for my readers! Get $10 off a $60 purchase for anything in the online store. Use coupon code CMD00002 at the end of the check out in the comment box! Choose from fragrances, skin care, hair and makeup products from brands such as Anna Sui, Burberry, DKNY, Guerlain, Elizabeth Arden, and so many more, too many to list! Best yet, you can use the two coupons together - make a $20 baby product purchase to redeem the $5, and another $60 worth of products to get the $10 off! Get FREE shipping for purchases over $70 in Canada (after coupons deduction and before tax). Otherwise shipping is just $7 in Canada, and $12 in the US. Fiona from Shifeon writes, "I hope this will make your readers and subscribers happy and save more =)". Thanks so much Fiona for these deals! These codes expire Oct 15, 2009. Shifeon is located in the downtown area of Vancouver on Robson Street, as well as in Oakridge Center. You don't often see Maclaren sales, so jump on this one if you're in the market to buy! Get 15% off Maclaren strollers and accessories with code mac15! 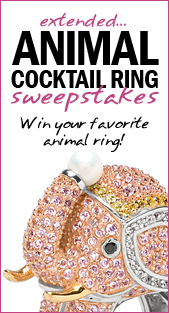 Valid until Saturday, Sept. 12, 3:59PM EST. You get FREE shipping on orders over $150, so this is a great deal (all Maclaren strollers are more than $150)! 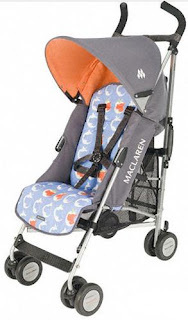 Maclaren is a premier stroller brand known for their style and durability. Get this deal at GingerbreadMonkeys.com. Pinky Blue Children's Boutique has a huge sale on, including 50% off summer clothing and a 2-for-1 sippy cup sale. All clothing from previous seasons is 50% off, and there are brand name styles by Deux par Deux and Mexx. There are dozens of other items on sale, including shoes, toys, blankets, baby carriers, high chairs, and more! There is a also a sale on Safe Sippy cups, buy one get one free! Regular price is $18.95. You can also get a 15% discount for online or in-store purchases of over $100! Use code YMF09. This special code comes courtesy of Yoyomama, a with local information for "mums" in the Vancouver Lower Mainland. Fine Print for 15% code: Valid till September 30, 2009. Excludes strollers, car seats, items on sale, special orders and shipping. Not to be combined with offers or promotions. Shopping cart will calculate the discount on your total including items excluded from this offer. Click here to check out the sale at www.pinkyblue.ca. Pinky Blue Children's Boutique is based in Richmond, BC. Please Mum is still offering free standard shipping within Canada, plus there are lots of discounts and summer clearance items - it's a good time to stock up for next summer! Entire Back-to-School collection is 30% off. Additional 15% off when you spend $75. Additional 30% off when you spend $125. $5 off all Deep Winter Overalls. $5 off all Deep Winter Parkas. Up to 70% off in the Clearance section - super deals on summer styles! I've always liked the Please Mum clothing. Their garments are nicely made, with quality materials. Headquartered in Vancouver, BC, they have locations across Canada. 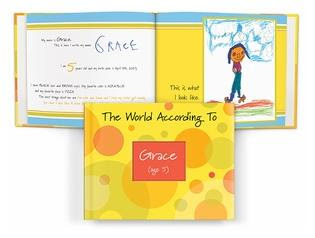 Here is a wonderful gift for any child - a personalized storybook. Purchase before September 14 and get FREE personalized stickers PLUS a shipping discount! Any personalized gift is bound to be a cherished keepsake. I See Me Personalized Children's Gifts (www.iseeme.com) offers a number of personalized items, including books, puzzles, wall art, T-shirts, and gift sets. I would love to have one of these items for my child! Click here to take a virtual book tour of the personalized book "The World According to Me". This is an example of just one of their personalized books. With this particular design, you can add your child's own drawings to the book - a kit is sent to you, which includes a set of 8 colour markers and drawing sheets - which you send back and they add it to the book. Or, you can upload some of your child's existing drawings onto their website. Click here to check out more Personalized Children's Books in their Virtual Book Tour section. Until September 14, you will get FREE PERSONALIZED stickers with a book purchase! Plus, there is shipping special with coupon code FSW635: for the US, you get Free standard shipping within the continental USA; For Canada, the shipping cost will be reduced by $7.25. Their regular shipping rates to Canada is $10 per book, so with this code, shipping to Canada is just $2.75! As this discount is applied just once, if you want to buy multiple books, I suggest making each book a separate order, and that way you can use the free shipping code each time! I See Me is based in Cannon Falls, MN, USA. 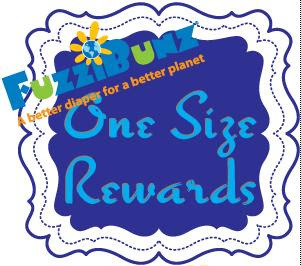 FuzziBunz Diapers is sponsoring a FuzziBunz One Size Rewards Program! Buy 9 of their one-size diaper, and you will be rewarded with freebies worth $40! This program is open for US and Canadian residents! The FuzziBunz Diapers One Size Rewards Program rewards you when you purchase 9 or more FuzziBunz One Size Diapers! You can get $40 in FuzziBunz goodies from diapers, accessories and more. To get this deal, you must purchase 9 FuzziBunz One Size Diapers, and submit your purchase information on the FuzziBunz website. There is a list of "authorised retailers" on the website, however, the website also states that "retailer participation not needed to apply for rewards - just proof of purchase and Rewards Form required - no diapers bought on Ebay are eligible for the Rewards Program." So it would appear that you don't necessarily need to purchase from their list of retailers. To view the complete details on the FuzziBunz website, click here. Eggs.ca - the Egg Farmers of Canada - are offering a coupon on their website for Buy One Get One McDonald's Breakfast Sandwich to promote eggs. Buy any Egg McMuffin, Bacon ‘n Egg McMuffin or Sausage ‘n Egg McMuffin breakfast sandwich at regular price and get a second same McMuffin breakfast sandwich free! Share your free sandwich with a friend, as one Egg McMuffin is 290* calories, Bacon ‘n Egg McMuffin is 310* calories, and a Sausage ‘n Egg McMuffin is 440* calories (* info from McDonalds.ca. 140 calories from each sandwich is from the English Muffin! ). I personally really enjoy these breakfast sandwiches, calories and all. Interesting that Eggs.ca would be promoting with McDonald's! Valid at participating McDonald's restaurants in Canada from September 9 to October 4, 2009. Product availability varies by restaurant. See coupon for further details. Click here to get your coupon from Eggs.ca! Le Baby Shop is having an end of summer clearance sale! Here are some of the deals you can get from this Quebec company that specialises in unique, fun, and environmentally friendly baby and children's products. All Daily Tea clothing is buy 1 get 1 free! Free item must be of equal or lesser value. Cannot be combined with other discounts. MonkeyDoodlez Swim Diapers are 25% off, sale priced at $16.49. Lots of styles to choose from! Prince Lionheart Ultimate Wipes Warmer is 50% off, sale priced at $17.50. No codes required for any of these deals, the discounts are automatically applied. Shipping starts at $7.99 for up to $25 purchases. Diapers Deals at New & Green Baby Co. If you are looking to build your cloth diaper stash, check out these diaper deals at New & Green Baby Company - no codes required! Monkey Doodlez All-in-One Cloth Diaper Bundle (6 Pack) - Final Sale - 6 All-in-One Cloth Diapers that will fit from 8lb newborns, to older infant and toddlers. PLUS these bonus items: 2 Pail Pals - Diaper Pail Deodorizer Disc; 1 Sample Size Wipes Cubes (2 cubes to make up 1L of solution); and1 Reusable Cloth Wipe. Sale price: $104.99, save $27 AND you get FREE SHIPPING and the 3 freebies with this deal! Fuzzi Bunz Newborn 6 Pack - 6 tiny extra-small diapers in white, sage green and butter yellow and 6 newborn sized 4 layer microfiber inserts. Bundled price: $99 - save $44! Fuzzi Bunz Petite Toddler 3 Pack - Available in four colour bundles, these diapers come bundled with their own 4 layer microfiber insert. Bundle price: $59, save $12! bumGenius! 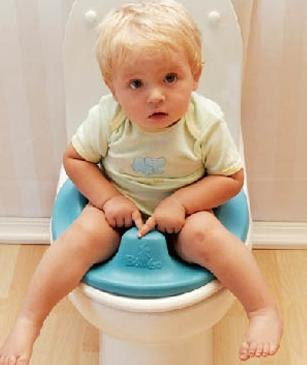 Organic One Size Diaper - Velcro - on sale for $25.99, save $3 per diaper! If you are new to cloth diapering and all the options have you confused, New & Green Baby Co. offers Cloth Diapering Workshops in the Lower Mainland at various locations. It costs $15 to register, but they will email you a $10 coupon to use at New & Green Baby Co. You can apply your coupon to your first purchase of $95 or more (before taxes and shipping) at New & Green Baby Co. These deals last until they sell out, so check it out soon! Are you following me? On Twitter, that is. By following me on Twitter, you'll get to see deals before they get posted on the blog, and some deals are never posted on the blog (there many reasons why it may not get posted on the blog). Some deals are "retweets" of other people's deal tweets. If you don't want to sign up to Twitter, all you need to do is check my Twitter feed by going to http://Twitter.com/CanadaMomDeals. Check often! Cross-border (US) shoppers: Carter's baby store coupon 20% off $50 purchase. http://ow.ly/o5eB Diaper bag for $10 w $50 purchase. FREE shipping again at MacCosmetics.com, NOW - SEPT 7, Canada only. No Code required. Avon Canada is offering FREE shipping with any order again, when you use a special code! This is a super deal, especially if you only want to order a couple of lower-priced items. Just enter coupon code LD2009! You can get deals like this Naturals Shower Gel for just $1.99 (regularly $10), or get a FREE Bath Ruffle with purchase of Skin So Soft Bath Oil($9.99, reg. 16.99). This deal expires on September 8, 2009, midnight. If you happen to find yourself internet browsing during the long weekend, take a peek at Sears.ca - they have a Labour Day Long Weekend sale on select items, up to 50% off, no code required! Plus, this special: "Buy Anything, Pay Nothing until January 2010" when you spend $100, and you pay with your Sears Mastercard or your Sears Card! "Buy Anything, Pay Nothing until January 2010" when you pay with your Sears Mastercard or your Sears Card! Or, collect Sears Club Points when you spend $100 or more. I read the fine print and do not see any deferred payment administration fees, but you may want to verify that as usually there is a fee for deferred payment deals. Please see the Sears Canada website website for full details and exclusions. This deal ends September 30, 2009. The Labour Day sale starts today and continues through September 7, 2009. If you missed one of the previous sales at GingerbreadMonkeys.com, they are having another sale: 15% off everything, including sale items! Use code b2s15 to get 15% off from now until September 8, midnight (EST)! Shop this sale at GingerbreadMonkeys.com. Shipping starts at $5.95 for a $20 purchase, and FREE shipping for orders over $150. Spend $80, get $25 in "Bucks" seems to be a popular sale trend! We saw this at Mabel's Labels, and now Honeybunch is also offering the same type of deal. Which is great for us deal-seeking mommas! During September, every $80 spent before tax and shipping will earn you $25 in Bucks. After your order is placed, a special code will be issued to you by email to get your $25 Bucks credit. The Honeybunch Bucks can be redeemed between November 1-20, 2009 on orders totalling $50 or more (before tax and shipping). Best of all, you can save even more - read this post on how to get 10% off your $50 order! Additionally, you can get 20% off this cozy, Canadian-made reflective fleece jacket and hat and enter code FALLFLEECE when you check out! This deal is good until September 30. Bucks can be earned and redeemed on online, phone and in-store orders. Honeybunch Bucks is a coupon code redeemable for a discount on an order during the redemption period and has no cash value. Here's a free back-to-school calendar that you can download and print. This free calendar has lots of tips for parents and recipes for each season. Click here to get the free calendar. This freebie is from Eversave.com, a US coupon and deals site. Milk Factory is celebrating its one-year birthday with a super 25% off sale! To sweeten the deal, you can get 50% off using a special code during the first 5 days of the sale! To get the 50% off deal, make a purchase before Sept. 5, midnight (PST? not noted in the info) and use code 5BDAY50%. After Sept. 5, to get the 25% off deal, use code HAPPY5TH. The sale is on until September 30. Some exclusions apply, please see the website. Milk Factory is based in Vancouver, BC. Their Performance Gear keeps kids dry and comfortable all day long, no matter where they are—the park, the playground, the mall, or the mountain. Functional and fashionable, their gear is built to last under everyday or extreme conditions. Vancouverites just LOVE our Canucks! If you have a little one that's a bit older and a Canucks fan, he or she will love this freebie! The Canucks are offering one of a kind Canucks Fan Packs to fans across British Columbia and around the world! The fan pack includes 4 random player cards, a Canucks sticker and tattoo. Click here to go to the Canucks website to sign up for this freebie! Get $10 off a $50 purchase at Honeybunch with this code! When you check out, use code scarlettbunch to get this deal. The code is good through September 30. Join their email list and they'll email you a $5 coupon! Honeybunch always has a HUGE selection of items to choose from, and a nice selection in the sale section, too. There are many unique items, and you will find eco-friendly toys, organic blankets, feeding accessories, bathing, clothing, shoes, stationery and decor and more. Items that I'm purchasing with my discount: the Bumbo Toilet Trainer ($45), a Die-Cast Mini Racer ($1.95), and a Banana Guard ($5.95). Click through all the categories, there are many unique items! If you live in west end Toronto, they will give you FREE LOCAL DELIVERY. Flat rates of $6.95 for the rest of Ontario, and $8.95 for out of province. Source: This is a special deal through Scarlett Lounge. Bugalug Baby has some excellent steals in their "Great Deals" section in their online store! On top of that, you can get a further 25% discount from now until September 15 with a code! This is Bugalug's massive back-to-school sale, get 25% off everything in the store when you use code SCHOOL25. In the Barrettes Great Deals section, you will find their super non-slip, glue-free clips starting from just $2.50! And in the Soother Clips Great Deals section, you will find these simply adorable designs from just $8.00. Standard flat rate shipping starts at just $2.50! Bugalug products are "Simple accessories that stay in place". 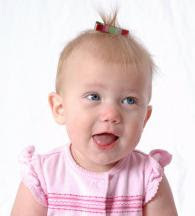 Choose from barrettes, pony loops, headbands and soother clips for girls and boys. Another great Canadian company, based in Calgary, Alberta.